Once famous for sprouting fuzzy green coats on clay figures, chia seeds are now revered for their nutritional powers. They have more omega-3s than salmon, more calcium than milk, and tons of protein and fiber. Because they're so high in fiber, it's best not to eat more than one tablespoon of the seeds per day. Plus, chia seeds can be so effective at lowering blood pressure that it's wise to talk to a doctor before trying out chia if you take blood pressure medication or have naturally low blood pressure. Chia seeds can be sprinkled whole on virtually anything. When soaked, chia absorbs up to 30 times its weight in water, forming a gel that can help thicken a jam and turn milk into pudding. Here are nine fun ways to use the versatile seeds. 1. Pancakes. Add a tablespoon of chia seeds to your favorite pancake batter to give it a nutritional boost. For crunch, sprinkle chia seeds on top of the pancakes. 2. Jam. For a superfast jam that thickens without too much sweetener, simmer fruit with just a little bit of sugar until it's soupy, then add a tablespoon or two of whole chia seeds. Simmer for a few minutes longer until the jam is thick. Refrigerate for up to a week. 3. Granola. Simply add whole chia seeds to your favorite granola recipe. 4. Smoothies. Pump up the protein and fiber of any smoothie by adding chia gel (for one serving, soak a teaspoon of whole chia seeds in one tablespoon water). 5. Agua fresca. Turn a refreshing agua fresca into an energy drink. Add one teaspoon of chia seeds per eight-ounce serving and chill for a few hours until the drink is lightly gelled. 6. Salad dressing. Whisk chia seeds into a vinaigrette; the longer it stands, the thicker the dressing gets. 7. Bread crumb crust. Mix the seeds with bread crumbs to use as a crust for pan-fried chicken cutlets. 8. Pudding. 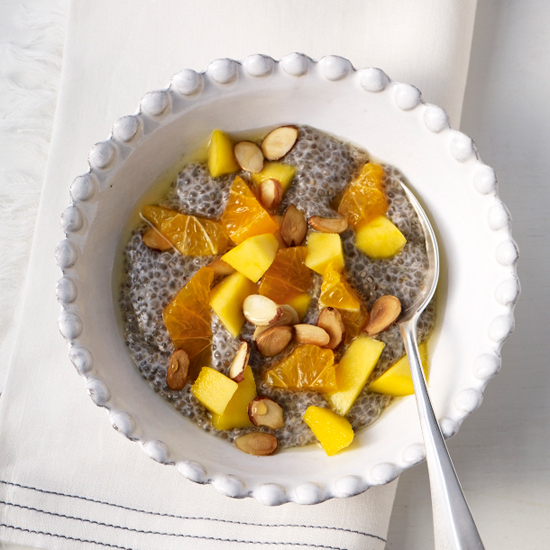 Make a three-ingredient pudding by soaking chia seeds in sweetened almond milk, which thickens to form a tapioca-like treat. 9. Egg substitute in cake recipes. Blend one tablespoon ground chia seeds with three tablespoons of water and use the gel to replace the equivalent of one large egg in cakes that call for fewer than two eggs, such as Applesauce Chocolate Chip Bundt Cake or Old-Fashioned Banana Bread.